The Domesday Book, compiled in 1086 for William the Conqueror, is a survey of all the manors in England. Sutton Coldfield is included, one of over 350 manors in Warwickshire, and details of its size and assets are given. The survey does not mention a church or a mill in Sutton, although there almost certainly was a mill and there was a chapel at the manor house. confirms the existence of a water mill for grinding corn, one of the assets of the Lord of the Manor. When a Sutton jury was describing the ancient customs of the manor in 1309, they referred back to the days of King Athelstan, saying “none of the inhabitants used to grind his corn but at the Lord’s water mill or the Lord’s windmill at Maney”. The water mill, known as the Manor Mills, was at the bottom of Mill Street behind Lower Parade. In 1433 the millers were Robert and Richard Milward of Perry Barr, paying the Earl of Warwick an annual rent of £4. 6s. 8d. They were required to “keep the mill in working order at their own expense together with repairs and improvements to the said mill as may be required, performing the customary work and services applicable to the mill and its ponds and dams, except that the lord will contribute any structural timber and will maintain the mill stream at his expense so that it flows under the great dam there”. Sutton ceased to be a feudal manor in 1528 when it became a self-governing town. The new Corporation wished to show the town’s gratitude to Bishop Vesey for all his benefactions, and so in 1533 they gave the profitable manor mills to Thomas Keen who had married Vesey’s niece Jane Gibbons. A traveller in 1535 described Lower Parade, which served as the mill pool dam, “a stone dam with an arch though which water flows to drive a mill”. The Sutton Court Leet continued to issue by-laws to protect the monopoly of the Manor Mills, penalising anyone who sent their corn to any other mill. Then in 1582 Thomas Keen, a descendant of the 1533 Thomas, sold the mill to his relative Thomas Gibbons of New Hall for £320 - this was about the time that Thomas Gibbons built New Hall Mill in competition with other mills for the local corn-grinding trade. John Wood was the miller in 1668 when the mill was severely damaged - on July 24th “there was a great flood of water, so great here at Sutton Pools that it flooded over the stone wall at the further end of the dam” - the mill suffered damage from which it never fully recovered. The next miller at the manor mill was John Power, and he was also the tenant of New Hall Mill until 1711, which now became the town’s principal corn mill. By 1765 the old mill pool was drained and converted to meadowland, and the mill which had served the town for 800 years was no more, but the road leading down to its site is still called Mill Street today. 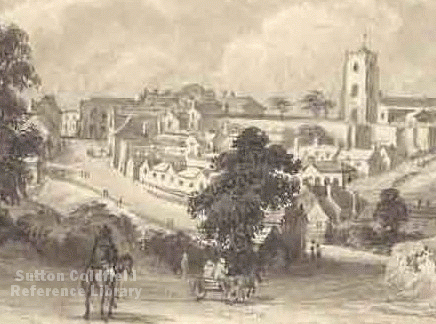 Mill Street in 1838, from a sketch by Miss Bracken.